My latest article for HGTV’s FrontDoor.com, has just been published. 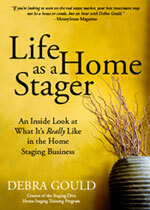 I wrote this one to help do-it-yourself home stagers realize that there are plenty of pitfalls if you don’t consult a professional stager. When you read the story, notice all the links throughout which help build traffic to the Staging Diva Directory of Home Stagers. Isn’t it time you joined so agents and home sellers can find you?